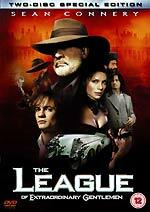 Although it wasn't the franchise-launching smash hit that the Producers and distributors Twentieth Century Fox had hoped it would be, The League of Extraordinary Gentlemen was a modest success, especially in Europe and in the UK in particular (it grossed over seven million pounds here). This may explain why the UK is getting a more lavish Special Edition DVD version than the one released US did back in December 2003. Although widely panned by the critics, there's much to enjoy in the film, an adaptation of the superb comic book series written by Alan Moore, and drawn by Kevin O'Neill. The film's plot, about a group of Victorian era literary characters (including Captain Nemo, Doctor Jekyll and Dorian Gray) who team up to fight evil, is weak, but there's a typically charismatic performance by Sean Connery (effortlessly playing H. Rider Haggard's hero Allan Quartermain), and some spectacular visual effects to compensate. Not all of the effects are convincing, but by the time they begin to take over the film you'll either have bought into it's Boys Own Adventure-style storytelling, or you won't. If you enjoyed films like The Rocketeer and The Shadow, then you'll probably get a real kick out of The League of Extraordinary Gentlemen. The film moves along at breakneck speed, hopping from one exotic location to another, so it's never becomes boring. This naturally doesn't leave much time for complex plot development, or much of an opportunity to get to know the characters: two aspects of the film that are particularly anaemic. Unfortunately, the film plays fast and loose with the source material, and distorts the story unnecessarily to shoehorn an American hero into the mix (the misplaced Tom Sawyer), and to showcase Connery's participation (at the expense of Dracula's Mina Murray - here reverting to her more familiar married name of Harker - who leads The League in the graphic novel). Fox's UK division has boldly released a two-disc DVD version of the film that's significantly more attractive than its single-disc Region 1 counterpart. You might think that plans for a more elaborate US disc were pared down at the last minute when the film wasn't a runaway hit, and that the UK simply picked up the discarded material, but that's probably not the case, since much of the extra material on the UK disc is focussed on the film's launch in Europe. Moving the bulk of the bonus materials to a second disc has meant that there's room for a DTS audio track (at 754kbps), which is offered as an option in the Language Selection menu. The US disc only features the Dolby Digital 5.1 version (at 448kbps), which, although impressive in itself, isn't as good as the DTS version, which offers a slightly cleaner sound, with improved stereo imaging. The mix isn't subtle, but it is very effective, often sounding very natural, and offering clear dialogue. Either track will showcase your subwoofer, if you have one, with many sequences that feature bass effects. The transfer is outstanding, with virtually no detrimental edge-enhancement, and no obvious encoding artefacts. Detail levels are very good, and the film has good contrast and colour balance. There are many dark scenes, and the disc handles them perfectly. The average bitrate is a very respectable 7.79Mb/sec. The subtitled German dialogue at the beginning of the film and the film's various location-establishing captions appear as they did in the theatrical version, and have not been replaced by player generated subtitles. There are English subtitles for the feature, both commentary tracks, and for the main bonus materials. The Trailers, TV Spots and European Premieres featurette aren't subtitled. The layer change is at 50'51", and should occur with minimal disruption. Disc One opens with three trailers (for In America, Master and Commander: The Far Side of the World and Runaway Jury). These can be skipped by fast forwarding, or selecting "Menu". The film is supported by two commentary tracks. The first is by Producers Don Murphy and Thomas Albert, and actors Shane West (Tom Sawyer), Jason Flemyng (Doctor Jekyll) and Tony Curran (Rodney Skinner, a.k.a. The Invisible Man). The second is by Costume Designer Jacqueline West, Visual Effects Supervisor John E. Sullivan, Make-Up Effects Supervisor Steve Johnson and Miniatures Creator Matthew Gratzner. You'll note that, aside from the other key cast members, that Director Stephen Norrington is conspicuous by his absence. Tales of disagreements between the studio, Connery and Norrington have been widely reported in the press and on the Internet, and reports that the Director and the Producers lost control of the film seems to be supported by the plentiful deleted scenes on Disc Two. Assuming that there's some truth to the stories, you'd never know it from listening to the commentary tracks, or from watching the other supplemental material on the two discs. The bonus materials paint an incomplete picture. Neither do you get to hear from the creators of the original source material. Both tracks are worth listening to. The first features a few choice anecdotes about working with Connery. You'll also hear about the absurd lengths the costume department went to to get specific fabrics (if you've wondered how a film can cost so much - The League of Extraordinary Gentlemen is reported to have cost nearly $80m - here's a good explanation). There's also a great anecdote about a oil can prop; a story about how a featured character was erased from the film; and some very interesting comments about how relatively cheap CGI effects are driving effects budgets down, and how producers are pressuring effects company to use CGI even where more traditional techniques would create better results. The supplements on the second disc are broken down into three sections: Pre-Production, Production and The Release. This section contains two items: Matters of Pre-Visualization and Stills Galleries. The first item on the menu, Matters of Pre-Visualisation, throws the viewer in at the deep end, with a ten-minute look at a process that's apparently becoming commonplace (the technique has already been featured on the Star Wars - Attack of the Clones and X-Men 2 discs, for example). It shows how entire sequences (perhaps the entire film?) can be mocked up using low-resolution computer graphics, enabling the Director to make decisions about the position of the camera in relation to his sets and cast before the sets are even constructed. It's a powerful tool, which even makes allowances for the type of lens that the camera will use. Its use on The League of Extraordinary Gentlemen is demonstrated through two memorable sequences: the arrival of the Nautilus, and Mr Hyde's first transformation back into Doctor Jekyll. If you were expecting photographs in the Stills Galleries, you'd be mistaken. Instead you'll find a good array of blueprints, intricate design sketches and costume designs, divided into four sections: Vehicles, Weapons, Locations and Characters and Miniature Designs. There are a few dozen images here: undoubtedly only a tiny fraction of what was produced for the film, but nevertheless worthwhile. This section is divided into two sections: Assembling The League and Deleted and Extended Scenes. The two commentary tracks and the Assembling The League documentary are the only extra that are contained on the US disc. Assembling The League is a well-crafted fifty-four minute documentary containing behind the scenes material and interviews. It's broken down into six sections (Origins, Attire, The Nemomobile, Making Mr Hyde, Resurrecting Venice and Sinking Venice). These sections are selectable individually, but since Fox has kindly provided a "Play All" option, and they play seamlessly back-to-back, no doubt most viewers will watch it Assembling The League in one chunk. The material is densely packed, and generally fluff-free, often using comic-strip style caption boxes and pictures within pictures to tell its story. Nothing is covered in any great depth, and it ignores many aspects of the production (the script development, the music, and the editing, for example), but fans of the film and casual viewers alike should be very satisfied. For example, you'll see a lot of Sean Connery at work, and hear his comments on the film (he says he almost turned it down because it was "too tricksy", and admits that he turned down roles in The Matrix and Lord of the Rings for similar reasons). Once again, though, Stephen Norrington is notably absent. The most interesting and entertaining section is Making Mr Hyde, where you'll see Doctor Jekyll (Jason Flemyng) transform into Mr Hyde, with the assistance of some amazing prosthetic makeup and a full-body animatronic suit. The Resurrecting Venice section looks at the giant sets constructed for the film; Sinking Venice focuses on the model work required to depict the destruction of the city. The Mission - a six-minute version of the scene where Quartermain is briefed by M, and introduced to Captain Nemo, who explains his motives for helping the British government, Skinner and Harker. Outside Dorian's Place - Mina's presence gains the League members entry to Gray's house, leading Quartermain to comment that she fancies herself as their leader, a nod to the source material. Gray's Library - an extended version of the League's introduction to the Fantom, who initially offers them the chance to join him. Sawyer Joins The League - Sawyer pursues the Fantom through a derelict building, but he escapes. Sawyer formerly introduces himself. Dinner Aboard The Nautilus - an extension of the scene where Quartermain apologises to Nemo for calling him a pirate. Nemo has arranged a sumptuous meal, but the other League members ("we're not a team") have snubbed Nemo's invitation, leading Quartermain to dub them "rude buggers"! Jekyll's Offer - a short scene, where Jekyll, feeling useless, anxiously asks if he can help. Quartermain replies "Don't worry, Mr Hyde will get his hands dirty". Treachery - Nemo and Ishmael investigate the change in the Nautilus's course, and there are signs that Skinner may be the culprit. Past Lovers - this is a slightly different version of the meeting between Gray and Harker, when she's analysing the powder that Nemo found, using alternate takes. There's also an extra line or two describing their former relationship. The Beast Within - Nemo and Jekyll confide in each other. This is a nice character moment: a sorrowful Jekyll tells Nemo that Hyde "has done every evil a man can do, and my curse... I recall his actions". Nemo replies "I sympathise. My curse... I recall my own". Flooding The Engine - Sawyer stalls the Nemomobile, as Venice crumbles around them. Quartermain and the Fantom - an action scene where Quartermain fights the Fantom's guards, eventually cornering his quarry, who escapes when the Winchester rifle jams. The Cemetary - a longer version of the cat-and-mouse game in the cemetary. Mina Warms Up - en route to their destination, Quartermain relaxes as Mina flirts with Sawyer. To The Death - a slightly extended version of the fight between Mina and the traitor. None of the deleted scenes would have added much to the finished version of the film, although one or two of them would have helped clarify a plot point or two. All the deleted scenes are presented in rough form, with incomplete effects shots (there's a modern crane in one shot, and another where the "split-screen" joins between two pieces of film are evident, for example). They are also presented without music or or other post-production enhancement. Comparing the scenes to the finished versions reveals how much the film has been improved by the colour correction ("grading") process. The Deleted and Extended Scenes are presented in non-anamorphic widescreen format, and are often of relatively poor quality. This section is comprised of Behind The Fantasy, Marketing, European Premieres, four Trailers, TV Spots and Posters. LXG - Behind the Fantasy is an eighteen-minute promotional TV special hosted by the asinine Andi Peters. Words cannot begin to describe how annoying Peters is, so here's a couple of choice quotes: "Who or what are the League of Extraordinary Gentlemen? ", "Rodney Skinner, a.k.a. the original Invisible Man" and "[The League of Extraordinary Gentlemen is a movie with] more Sean Connery than any other movie". Apparently aimed at children, or addle-minded adults, it includes brief interviews snatched during the film's Prague premiere. There are also a few glimpses at the cast members as they normally appear, culled from various sources (it's quite startling to see Naseeruddin Shah out of costume, and Stuart Townsend (who plays Dorian Gray) is virtually unrecognisable). If you don't blink, you might even spot a glimpse of the elusive Mr Norrington! There's very little here of any value that's not already covered in Assembling the League. On the review disc the Marketing and European Premieres menu options both lead to the same eight minutes of virtually worthless red carpet interviews from the Prague and London premieres (the latter presented by media whore Paul Ross). This suggests an authoring error, which may be corrected for the finished discs. There are four non-anamorphic theatrical trailers and a dozen American TV spots. These include some shots in incomplete form (Jekyll's "Don't be scared" line in the Hip Hop spot, for example), and it wouldn't surprise me if they contained other material which didn't end up in the final film. Another point of interest here is their pointed reference to "An Invisible Man" rather than "The Invisible Man", apparently because Fox were unable or unwilling to license the rights to the Hawley Griffin character from H.G. Wells' estate. Note that one of the TV spots is titled Character League I.M. Rev. Note, too, that some trailers refer to Mina Harker as "Dracula's Bride". Posters is a small gallery of various artwork created to promote the film. They're poorly presented, and the selection is far from comprehensive. The additional bonus features that the UK disc offers over the R1 version aren't all of the highest standard, but they make it far more appealing. Fans of the film will want to upgrade for the additional Deleted and Extended Scenes, and the Matters of Pre-Visualization featurette. The other bits and pieces are less worthwhile, but the UK disc has 'em, and the US disc don't have 'em! The other big plus is the DTS track, for those who are equipped for it. Although there were no complaints about the picture quality of the US disc, the UK disc should be even better: the space the additional DTS track takes up is small compared to the space that would be taken up by Assembling The League on the US disc. (It's been moved to the second disc for the UK version, so there should be a lot more room available for the film's video data). It's rare to see the UK division of a Hollywood studio being allowed to substantially improve on the R1 release, so salutations to Fox UK for taking the initiative, and creating an excellent DVD.